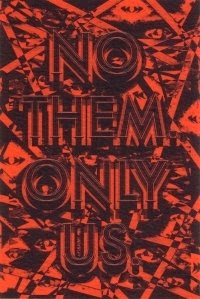 WOUNDED BIRD: "No Them Only Us"
The artwork pictured above, a double-sided print by Mark Titchner, is from the exhibit described below at the Leeds Art Gallery. This fascinating and unusual exhibition, which looks at how artists have pictured the shape of society from Renaissance times to the present, opens its UK tour at Leeds Art Gallery. A society without stratification is barely imaginable, but how do we picture our own system of hierarchies, of difference? British writers, political theorists and artists have used numerous images to picture ‘who we are’: describing us through ‘orders’, ‘estates’, ‘classes’, ‘stations’, ‘degrees’, or ‘ranks’. But only this latter term has kept the same meaning over six centuries. With over 100 exhibits, new work from leading contemporary artists and the presentation of new social research from academics and government agencies. The words on the painting were suggested by Bill Clinton's acceptance speech at the 1992 Democratic Convention. And so we must say to every American: Look beyond the stereotypes that blind us. We need each other - all of us - we need each other. We don’t have a person to waste, and yet for too long politicians have told the most of us that are doing all right that what’s really wrong with America is the rest of us - them. Them, the minorities. Them, the liberals. Them, the poor. Them, the homeless. Them, the people with disabilities. Them, the gays. We’ve gotten to where we’ve nearly them'ed ourselves to death. Them, and them, and them. But, this is America. There is no them. There is only us. Well, we're not there yet, are we? I was intrigued by the sculpture/painting the moment I read the words. It is a large block with all sides painted, taller and wider than it is thick, like a domino. At first, I thought the words were quite satisfying - if only the world was like that - but, as I thought about them more, I realized that more than one meaning was applicable. The poster below, titled "Pyramid of Capitalist System", was included in the exhibit, also. It is dated 1911, and was published by the Industrial Worker then out of Spokane, Washington, which describes itself as the "Foremost Exponent of Revolutionary Industrial Unionism". To read the words, click on the picture to enlarge. See what the caption for the church says. Sadly, it's too often true. The whole pyramid looks just about right for today. A blogger in the UK, Good As Dead doesn't like the exhibit at all. There is a faint smell of some thing gone off wafting through the cherished halls of the Leeds City Art Gallery. It is the careers of the curators of the latest installment in the continuously disappointing gallery programme. Not that this Blog wishes to make any enemies within the Leeds arts intellgensia (who us?! ), but the current show Rank: Picturing The Social Order 1615-2009 is so SHOCKINGLY BAD that the curators should soon be meeting their P45s in a dark Leeds alley. Whew! The writer should tell us what he/she really thinks. Another blogger from San Francisco, r+d, panned the show, too, but with less vitriol, saying that it was not an art show, but an educational exhibit, and that there was good art in the mix, but the art was overwhelmed by charts and graphs and educational tools. 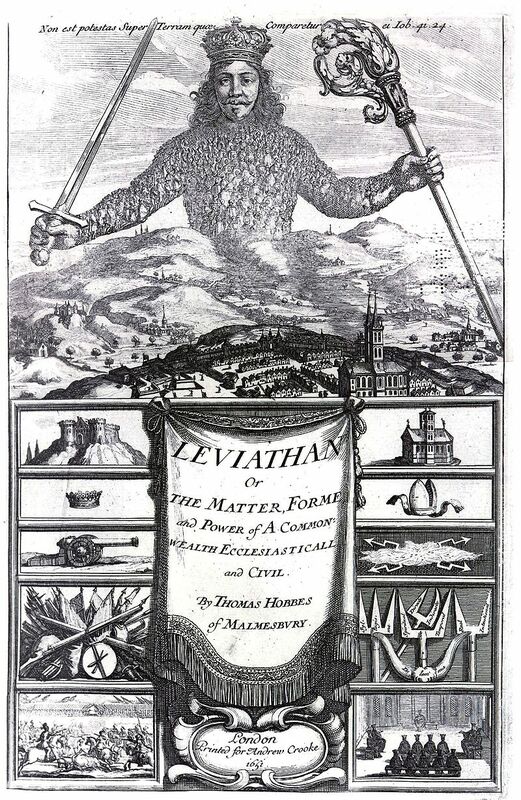 A blow-up of the frontispiece of Thomas Hobbes book, Leviathan, was part of the exhibit. My thought? Ah, what do I know? However, I engaged with the show on quite a high level. It's possible that the educational material overwhelmed the art, but, on the whole, I felt both pleasure and excitement as I walked through the exhibit the first time and again with Erika and Susan on the day of our gathering for lunch at the Tiled Hall Café in the Leeds Art Gallery. As to "Rank", the subject of the exhibit, "Plus ça change, plus c'est la même chose". Thank you for an idea for tomorrow's sermon. "no them, only us." I've been having a skirmish with the ECW about this concept. MA, I'm pleased to be of assistance with your sermon. I really liked the exhibit, and I was stunned when I read the bad reviews. Well it it isn't "Art" at least it pictures reality. Such as it surrounds us. And I found it a timely reminder, for us, standing on the ruins of yet another a failed Anarcho-Capitalist Age and on the brink of a resurgence of Keynseyanism, that the structures of Society (not always visible to us) have and can be thought about and studied - and have indeed been so. Göran, I did not know. I do know that it was Keynes who was supposed to have said, "In the long run, we are all dead". I've used that line many times. He's surely right about that. But also, thing like these make me remember that my dear papa's own Father had a cotton mill, the largest factory building in Scandianvia it is claimed (built by English and Scots Engineers), which as late as in 1890 "employed" children. Perhaps some of the critics would prefer art to be "pure" and elevated above the concerns of social structure and historical struggle? Heaven forbid that it should be didactic. Granted, it what one has is only "educational" then it probably is not rising to art, and I emphasis the word "only." Art, however, is always a product of its time and place, even when it transcends them - as good art does. If a creation deals with the realities in which we live, engages us, and helps us see in a new or fresh way, then I am certainly willing to call it art. I tend to think that engaging us and helping us see are facets of most art (not necessarily all). A work may also simply stun us into awe or horror or ecstasy, but that is certainly engaging. Thank you, Mimi, for sharing this experience with us. I am enjoying the recounting of your travels. Paul, there's no question in my mind that the centerpiece of the show is art. That's the top picture in the post. It's not flat, and much is lost in a one-dimension photo. Often I disagree with art critics, because my response to art is personal and highly emotional - or not. I guess the "or not" pretty much means, "Eh", or "I was not moved, or amused, or whatever". I was entranced by this exhibit, and I believe that Erika and Susan caught my excitement and wanted to see for themselves. "fraid I have to agree with the critics. Too heavy on the didactic side and not enough aesthetic payoff. I would save the vitriol for shows in New York and London that really deserve it (too many of them), and not fire it at well-meaning curators in Leeds who don't deserve it. I have no problem with art being didactic (Lord knows I do it all the time, rarely successfully), but there are ways to learn a valuable lesson without feeling like you're learning a valuable lesson. WH Auden once said that the art of poetry is mastering the ten thousand ways of NOT calling a spade a spade. That said, I loved the Capitalism poster. Nobody did run-of-the-mill didacticism better than those 19th century poster makers. I'm a little more pessimistic about our time. I think it looks more like Leviathan than the Capitalism poster; everyone willing to sell their souls for a little bread and safety. Counterlight, of course, you could be right, and you probably are, but I liked it anyway. I passed quickly by the parts of the exhibit that did not engage me, and they were there, but I did not linger and have them spoil the moment. I badly wanted to take a picture of the poster, but I was admonished not to when I took my camera out, so I was glad to find a picture online. The least amongst us are ground underfoot in every age. Thus it is, and thus it ever was. JCF, that's exactly what happens. 2 Trillion, was it the "No Them Only Us" painting painting that you purchased?